This blog post is something that’s been floating around in my head for a long time now. Ever since reading “The Dressage Training Pyramid for Mere Mortals”, I’ve been thinking about how there’s so many more components involved in the typical USDF Pyramid of Training than just one triangle can tell! 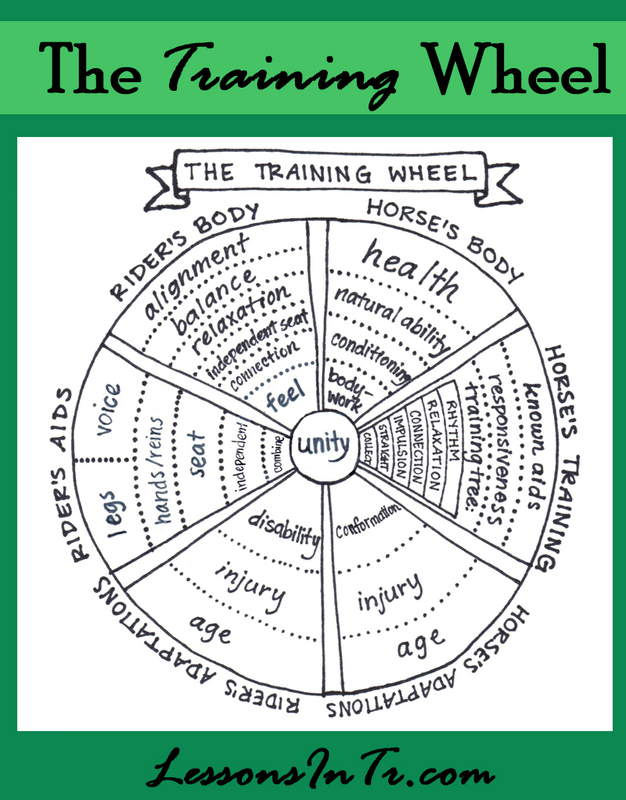 So I’ve created this “Training Wheel” with what I consider all the major components of riding/training: of training a horse and yourself toward moving together in unity. The Training Wheel is made up of multiple triangle-like building blocks of the different components of riding/training. Like a wheel, there is no beginning and no end. There are multiple beginnings, because there are so many places to start – on yourself, on your horse, on your body, and so on. You also never really reach the end, because while the end goal can be considered perfect unity with your horse, perfection is nearly impossible to reach. The components are not exactly direct building blocks: you don’t achieve the base and then add the next one. Often you are working on many blocks or levels at the same time. Perhaps that’s why the components are in the air space between the spokes, because you have room to move around within them! However, the components do work like a pyramid in that often you really do need the foundation blocks before achieve the higher ones. Like a wheel, you are always spinning around, working on different pieces of training – sometimes one at a time, sometimes several things at once. Like a wheel, each part is supported by the whole (this analogy would work out better if the components WERE the spokes, lol). Without one area you are missing a part of the picture of what is going on when you ride and train. Like a wheel, each part affects the whole. The spokes represent the place each component overlaps and affects the other (I didn’t write anything in the spokes because I forgot I wasn’t sure what to say). For example, how well you can apply the aids depends on your body (alignment, balance, etc. ), what aids you can apply depends on what adaptations you need, and so on. Like a wheel (perhaps? ), the components are also reflective – one area reflects what’s across from it and around it. For example, how effectives you can apply the aids (even if you’re doing it right) is a reflection of how well the horse is trained to respond to those aids. And lastly, like a wheel, one side of the wheel carries more of the load, spreading it to the rest. 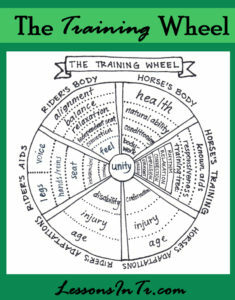 In this wheel’s case, usually it’s the horse or the rider who is further up their pyramids – and it needs to be that way. Horses in training (low in their pyramids) come out best when trained by experienced riders (high in their pyramids). Beginning riders (low in their pyramids) are best taught on experienced horses (high in their pyramids). But there is a nice place in the middle where intermediate riders can learn a lot riding intermediate horses. The “Rider’s Aids” are the natural aids, using them first independently, then in different combinations. This is the rider’s ability to communicate with their horse. We tend to learn them from the outside in (or bottom of the triangle up), but once we achieve the coordination of using them, we tend to apply them to our horse from the inside out. For example, often the first thing riders learn (at least in TR) is to use their legs, but on a well-trained horse you first use your seat. The other components affect this. The ability to apply the aids correctly is affected by the rider’s body: their ability to balance, have an independent seat, etc. This is why many trainers start with teaching the rider to balance on a horse on the lunge line. The ability to apply the aids is also affected by the rider’s adaptations – for example, they may not be able to correctly apply the leg because of physical reasons, and need to use a voice aid or crop instead. This component is the only one I intentionally put opposite of another: the Horse’s Training. Because the effectiveness of your aids is only as good as your horse’s training. The “Rider’s Body” is how well a person’s body balances on the horse and responds to the movement. First is alignment, or the rider’s posture, which is needed to have good balance. You also need relaxation, not floppy, not tense, but held in place enough to be stable, and relaxed enough to move with the horse without hindering it. All these blocks are needed for an independent seat, which allows you to connect with your horse (have kind contact – in the reins, in your seat, etc.) and develop a “feel” for the horse in which your body can feel what the horse is doing and respond correctly. Again, all the other components affect this. For example, the horse’s body – his health and conditioning – affect how the horse moves, which affects how well the rider can balance. The “Horse’s Body” is how healthy, balanced, fit, and agile the horse is. The first of all starts with health – a horse can only move well for you if he is healthy. Then come the horse’s natural abilities: each horse has their own ability to balance, carry himself, and move well (or not). Natural abilities are somewhat limiting – not all horses are built to be Grand Prix dressage horses, or carry heavy riders. That’s just the facts. Then come conditioning: the amount of strength, endurance, balance, flexibility, and habits of self-carriage the horse is (or can be) trained to have. Lastly I listed bodywork, which is massage, chiropractor, and other therapies. I listed it last because bodywork can help improve all the other factors, but is typically not the place to start (for example, you can give massages every week but if your horse is not healthy or conditioned he won’t perform as well as he could). Note: these blocks can be improved with horse management programs and your training/exercise riding program. The “Horse’s Training” means to the aids and a way of going. The horse can only respond and move as well as he knows to respond to the aids! First you teach the aids (or cues), then you build responsiveness (getting lighter and lighter), and only then can you move on to further training, such as the typical Training Tree. Although you can start working on all the training tree components while you’re teaching the aids. Anyway, for example, a therapy horse can only go as straight as he is able to respond to the cues asking him to go straight – AND as much as his body allows him to be based on his conformation and conditioning. While related to the “Horse’s Body”, in which typically you can make improvements (in health care, conditioning, etc.) to improve the horse’s body, this component of “Horse’s Adaptations” are factors which you may not be able to improve in your horse and therefore need to make adaptations for, which could affect everything else. The factors are pretty self-explanatory. Examples: If the horse is older, he may not be able to be conditioned and build muscle as well as a young horse. Injury may inhibit the horse’s ability to move correctly, which affects the rider’s balance. The horse’s conformation (and the rider’s!) affects how the rider sits and balances on the horse. In the same way we make adaptations for riders, we need to make adaptations for horses. Similar to the Horse’s Adaptations, this is the component of the person which you may not be able to change and therefore need to make adaptations (although riding certainly can improve functioning in these areas!). As therapeutic riding instructors, we should be familiar with these, so I feel they too are pretty self-explanatory. I listed the biggest factors, and assume everything falls into here somewhere. Examples: Rider’s age affects leg placement, flexibility, stamina. Rider’s weight affects which horses they can ride. Rider’s injury and/or disability affects how they apply the aids or posture. Although I’ve already listed a bunch of implications in particular how the different components affect each other, here are some more thoughts. Difficulties arise in the training wheel when the foundation of each component is not there (or even the bottom few foundation blocks). For example, the Horse’s Training: if the horse is untrained, he gets confused and agitated about what you’re asking him to do; you can apply the leg correctly, but if he doesn’t understand it he will kick out. Or, the Horse’s Body: if the horse is unhealthy, he is unhappy and work may hurt him, causing issues in training; or if the horse is overworked, this creates poor health and an unhappy horse. The point is, when you have issues in training, start looking at these components, especially the lower blocks! In particular, where to start with therapeutic riding (TR) horses? As I said, beginning riders are best taught by experienced horses. Similarly, TR horses are happiest when all the components in their pyramids are met. So I find it best to get horses that have their side of the wheel already in place, so they can support the riders who don’t! For example, get horses that are already trained, because most programs don’t have time to train horses or wait for them to grow up. It’s also best to get a horse that is healthy and conditioned, again, especially if you don’t have time to train and wait for them to be well enough to enter lessons later instead of now. Following that, where to start with therapeutic riders? I’d say start with the bottom building blocks: a good seat (posture and balance), the basic aids, and the necessary adaptations. I’d love to hear your thoughts! I’m sure there’s many more components I haven’t thought of that are in there. For example, in TR we also have leaders and sidewalkers! Although I’d consider those adaptations. Anyhoo, LMK what you think, feel free to rip the idea to shreds or run with it! Love it… thank you for all your hard work… very useful.